When my brother Ward and I visited Josh Simpson in August 2000, we had an incredible time... Josh took us for a ride in his Piper Comanche (and even let me fly it for a while! 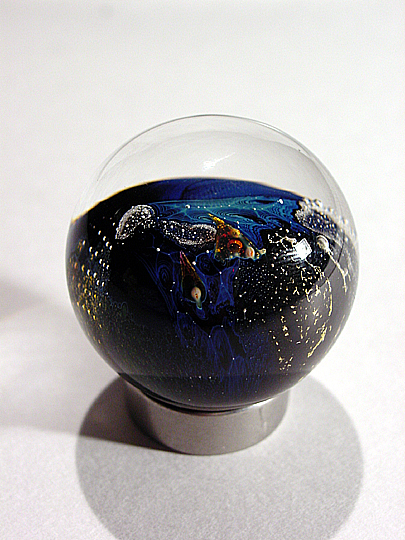 ), let us hang out in his studio all day with him and his crew of glassblowers, and gave Ward and I the opportunity to each create a small planet of our own. My small planet isn't very spherical "on the inside"... the opaque section is fairly flat on one side. It includes a small grid of bubbles, some areas of gold leaf, and some green "forests". Not spectacular, but pretty good for a first attempt at planet building. I'm very glad and honored to have had a chance to create this planet.